A technical hooded insulator designed for climbing, skiing and other mountain pursuits where you need both warmth and lightweight packability, the Hyperia Hooded Jacket is an alpine essential. The Hyperia’s ultralight yet durable Pertex® Quantum Air shell features a DWR finish that sheds wind and light precip when conditions change unexpectedly. Inside Icebreaker used their innovative MerinoLOFT™ insulation, a sustainable and high-lofting alternative to synthetic fills made from all-natural merino wool (up to 10% of which is recycled). MerinoLOFT retains warmth when wet and naturally helps regulate body temperature to keep you comfortable, whether you’re belaying on a multi-pitch climb or skinning along a backcountry ridgeline. The snug-fitting hood blocks the weather and adds insulation, zippered hand pockets and an internal zip pocket store small essentials, and offset shoulder seams eliminate chafing when you’re wearing a pack. Hyperia Hooded Jacket- Mens is rated 4.6 out of 5 by 14. Rated 3 out of 5 by Firsttimeicebreaker from The coat worked in the extreme cold While this jacket wouldn't be warm enough for me on it's own in -15 -20C with a light fleece vest underneath it worked quite well. We had a super cold snap with wind chills in the -30C range and with a light fleece vest and jacket underneath it was toasty warm. The fit is good and the fit guide helped a lot or else I would have ordered a size too small. The material does make a crackling noise when the temperature dips below -25C. I haven't worn it in a high output setting so i can't comment on how well it breathes. The hood fits well enough but did not test it in high wind conditions. Rated 5 out of 5 by MarcoT from My personal Merino sheep! Straight to the point: 9/10! I'm using this jacket for both city life (Vancouver BC), sport life (climbing), work life (travel to and working in a gold mine close to Alaska). My initial thoughts were not super positive, the jacket was feeling not so warm and not sitting properly on my body. After using for a while I realized that the temperature inside was not hot but pretty much always the same, I started to love it (even if I would personally prefer couple degrees more), I can wear it in the humid and hot bus, on the street at 2 Celsius, inside the bakery shop for 15 minutes and again outside with the classic Vancouver rainy day (yes the water resistance of the jacket works pretty good). Paired with an outer Gore-Tex shell works perfectly in harsh conditions and during sporting activities it regulates the body temperature really good. It is SUSTAINABLE! I'm tired of down jackets that are not environmental and animal friendly, this is a great choice if you agree with me. The jacket is not superlight and not the number 1 for packability but It does come with a little pouch you can use to store it. I am 6'1, slim/sport body build and the M suits me great, Sleeves are kind of long, very good in my case but take it in consideration. One thing I personally don't like too much is how the jacket sits on my back (not very tight fit) but I guess is gonna change from user to user. Two classic hand pocket of a decent size and upper internal pocket that can fit wallet or telephone. Hope this jacket is gonna keep its quality during trips and constant use! 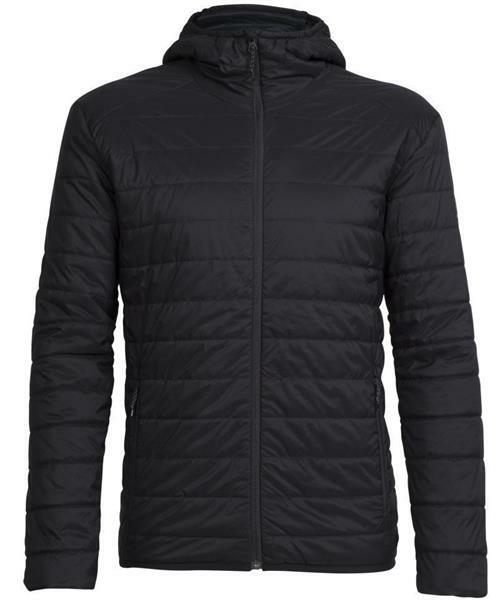 I begun using Icebreaker few months ago but this jacket convinced me 100% to keep this company on the list top when I'm looking for very good quality/ reliable clothing, they keep their promises. Color in the pictures is a bit yellowish due to my indoor light. Rated 5 out of 5 by BigTree from Lovin' this puffy! I've waited a long time to buy an insulated jacket but this one finally hit the mark. I like that it has a matte finish (why are so many shiny?) and it fits really well too. The hood is great and jacket keeps you warm in the wind. I'm 5'11 and 160-165 lbs and medium is perfect fir. Thanks so much for getting this right! Rated 5 out of 5 by Dennies from Lightweight Lightweight and keeps you warm. 10/10 would buy again. Rated 5 out of 5 by Wally409 from Great mid-layer Have yet to really test the jacket, but it’s a warm welcome to my layers! The Hyperia will end up seeing more than 40 days on a ski hill this season. The fit is true to size and is very comfortable. Another winner from IceBreaker! Rated 5 out of 5 by runner3200 from Perfect bridge jacket!!! Perfect jacket as I'm outside 3 hours a day walking my dog in all types of weather. Fits very comfortably and works well with a medium base layer. Bought the jacket to go tramping in New Zealand in March. It is light and will pack well. Quality is up to the high standards of Icebreaker. Ideal for fall weather between -5C and +10C. Meets all my needs. Highly recommend. Rated 5 out of 5 by Advent7 from Function and form A very effective outterwear for cold days and takes up little spacein your pack. Rated 5 out of 5 by JohnW from Love it so far ! I love the jacket's fit and comfort - lightweight and form-fitting. It feels almost magical in the way it keeps me warm but not hot while being so light. Really interested to see how fares when it really gets cold here in Canada.